March 30, 1931: “The Gumm Sisters” (Judy and her two sisters) performed at the Kiwanis Club, Kiwanis Hall, in Lancaster, California. No recording of this show is known to exist. March 30, 1937: This photo of Judy and other child stars at the premiere of MGM’s Captains Courageous was published. 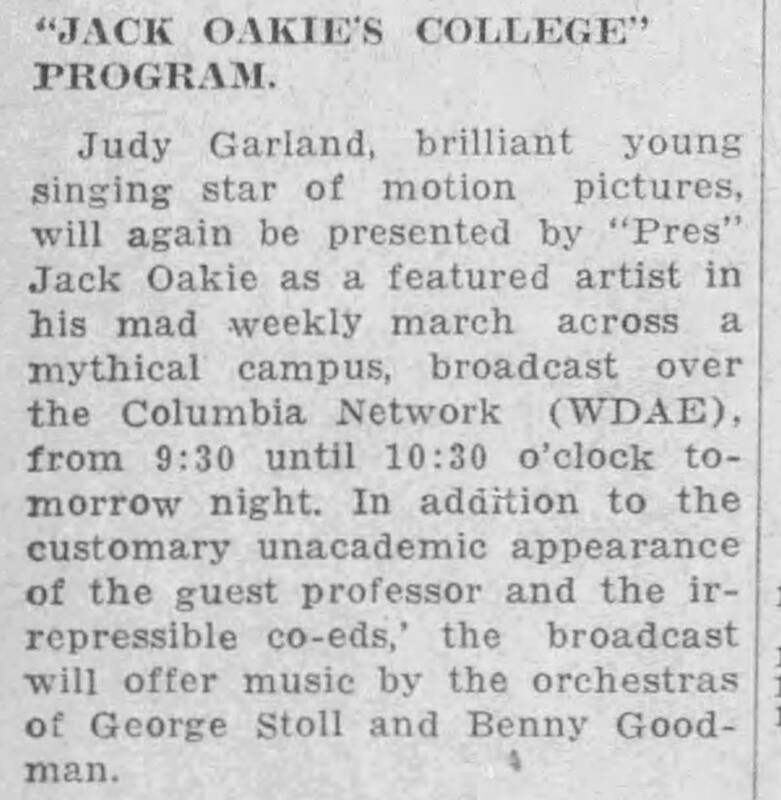 What’s confusing is the fact that the film did not premiere until May 14, 1937, which is documented by the “Los Angeles Times.” However, this photo and a few others were taken of Judy with “the gang” at an event that was, if not the premiere, then perhaps a preview since it obviously appeared in the newspapers prior to the actual premiere. March 30, 1938: This photo of Judy and her mom, Ethel, was taken in Minneapolis, Minnesota, during their stopover there while on their way to Judy’s birthplace, Grand Rapids, Minnesota. 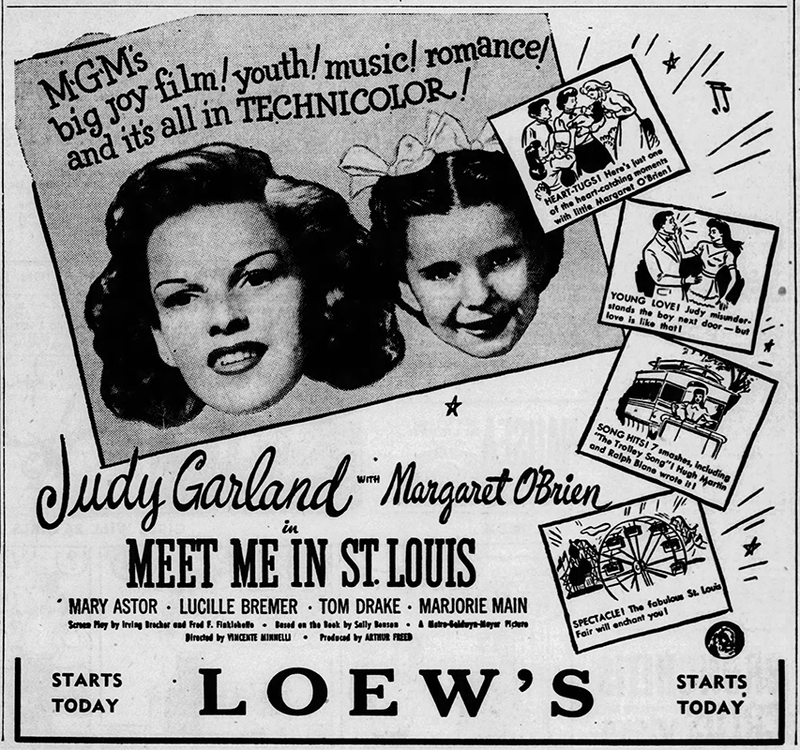 March 30, 1940: More MGM Judy Garland fiction. 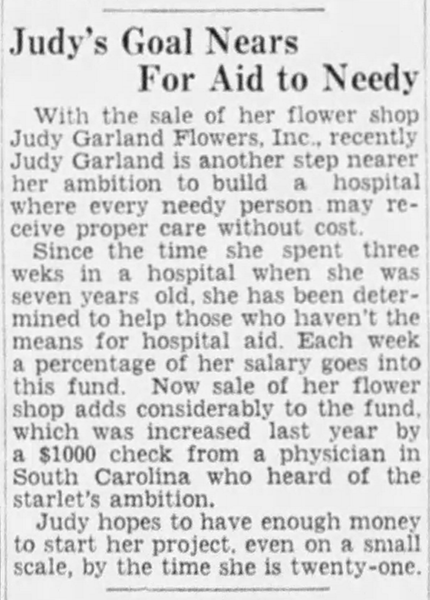 According to this article, Judy sold her flower shop as a step in building a hospital for needy people. 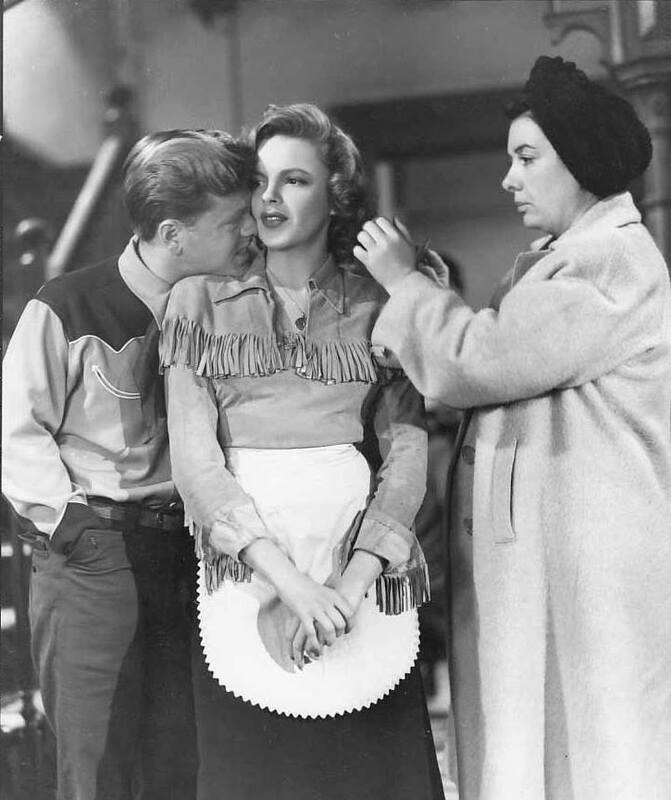 March 30, 1943: Filming continued on Girl Crazy. Time called: 10:45 a.m.; dismissed: 5:10 p.m. Scenes listed as being filmed were those on the “Interior Dorm” and “Interior Dean’s Home.” The first photo shown here was taken on this day. March 30, 1943: Judy appeared on the cover of the Swedish “Tempo” magazine. March 30, 1944: Meet Me In St. Louis filming continued. Well, not really. 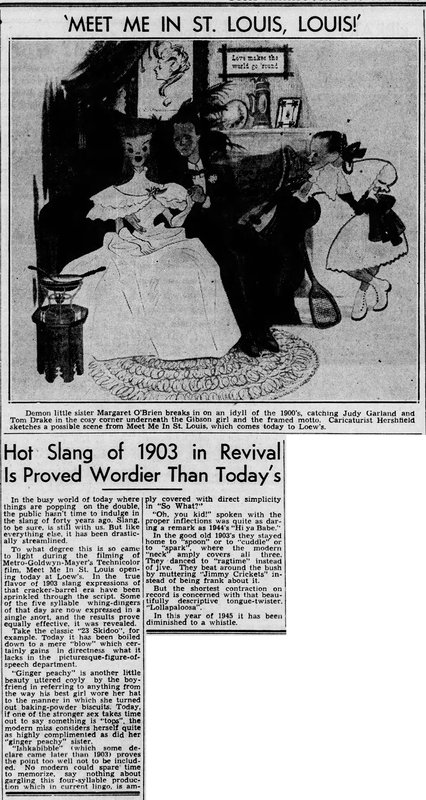 Judy had a call to be on the set at 10:00 a.m.; she was ready at 11:08 a.m. Judy then went home ill at 12:15 p.m.
March 30, 1945: Here’s a fun article about the “Hot Slang of 1903.” It’s a peach of an article! March 30, 1947: Jay Scott’s photo column, “Candidly Hollywood,” featured this recent photo of Judy. 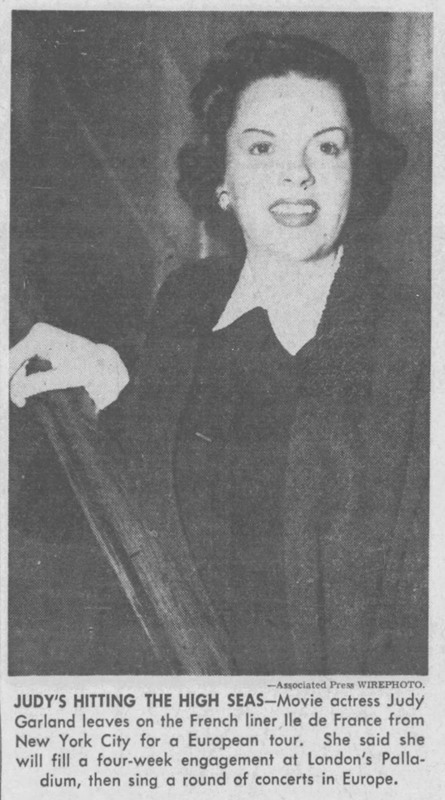 The photo is actually one taken on the night of January 27, 1947, when Judy and husband Vincente Minnelli attended the Los Angeles premiere of Till The Clouds Roll By. Judy guest starred in the film playing Broadway legend Marilyn Miller, Vincente directed her scenes and musical numbers. March 30, 1949: MGM recording session for Annie Get Your Gun. 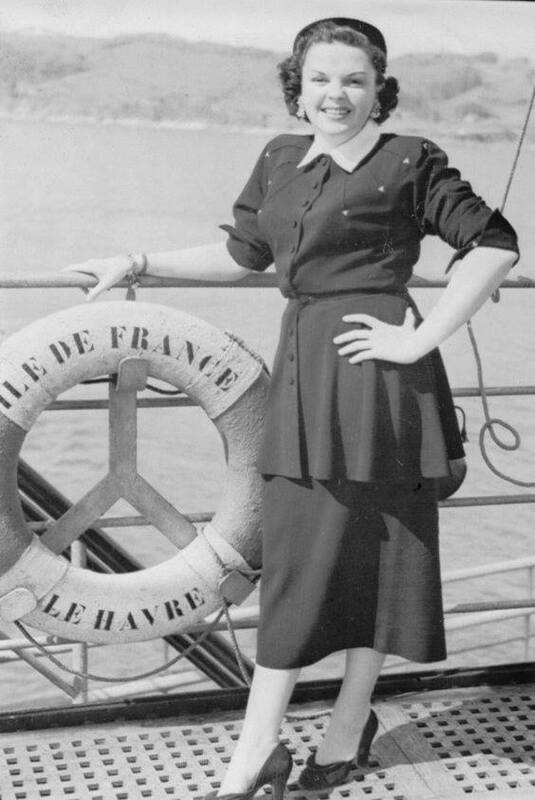 Judy pre-recorded the song “Let’s Go West Again” which was written specifically for her by Irving Berlin. After Judy left the project it was pre-recorded by Betty Hutton but ultimately cut from the film. Judy’s co-star, Howard Keel, also recorded his solo of “My Defenses Are Down” during this session. 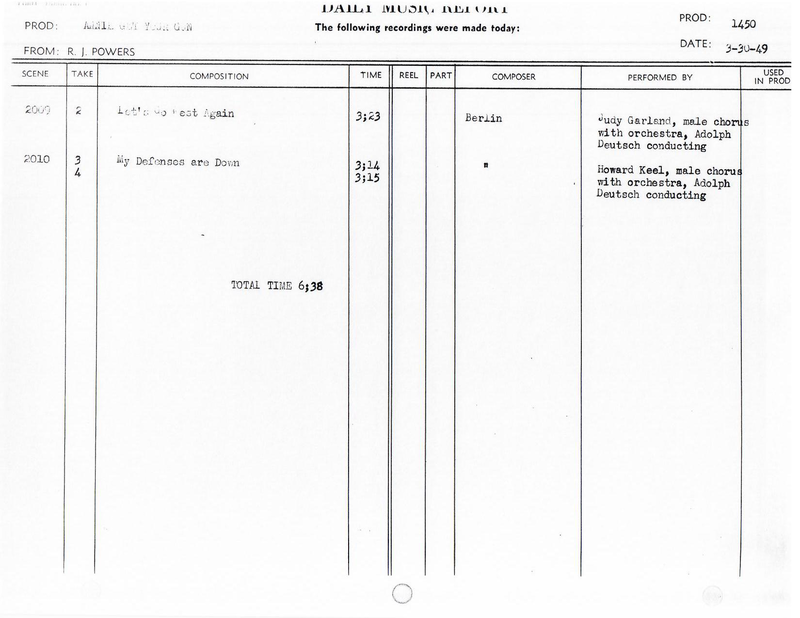 Time called: 11:30 a.m., due on set 1 p.m.; Judy arrived at 1 p.m.; dismissed at 1:45 p.m. It only took Judy 45 minutes to pre-record the song with the orchestra. 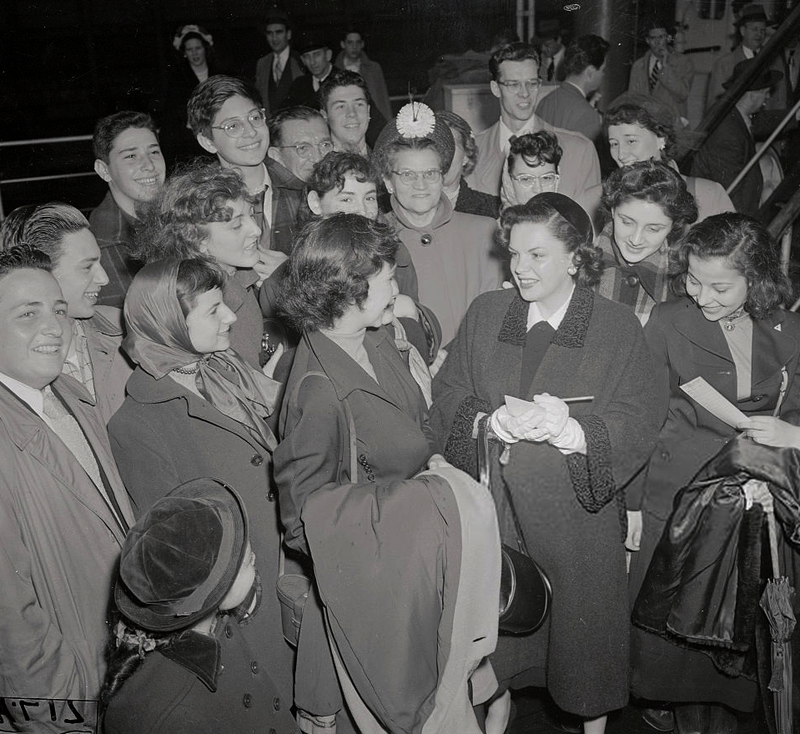 Photos: Judy with fans before leaving New York; Judy poses on deck; newspaper notices (published the following day). 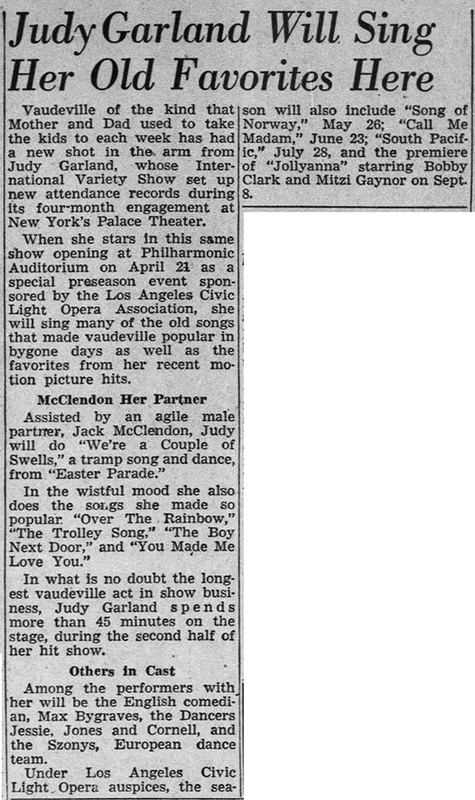 March 30, 1952: The “Los Angeles Times” noted Judy’s upcoming debut at the L.A. Philharmonic, which took place on April 24, 1952. 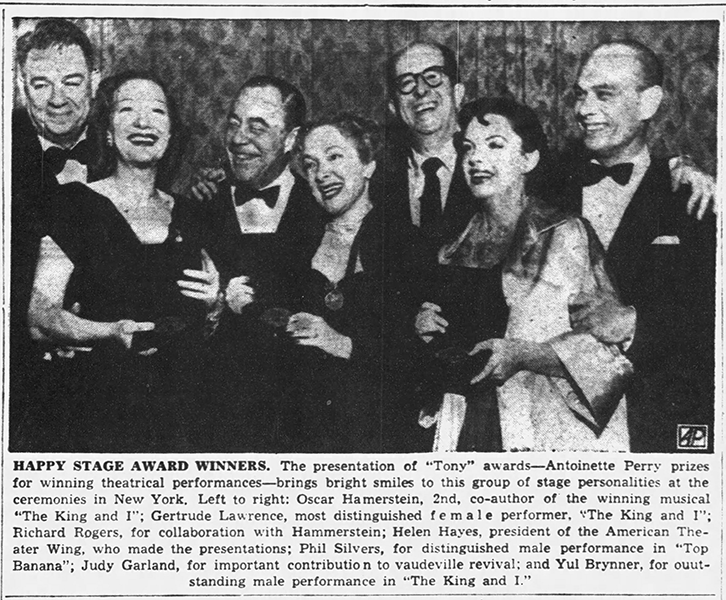 March 30, 1952: Judy was awarded a special Antoinette Perry (Tony) Award, for her Unique Contribution to Theatre 1951-52” at a special ceremony at the Waldorf Astoria Hotel in New York, in commemoration of her smash 19-week run at the Palace Theatre. At some later date, Judy had the Beverly Hills jeweler “Trabert & Hoeffler” mount the heavy, silver-plate 3” diameter coin-shaped award as the hinged lid of a .545 sterling silver reproduction of a ca. 1700 John Dixwell original drinking cup. She reportedly kept the award on prominent display in her library throughout the remainder of her life. 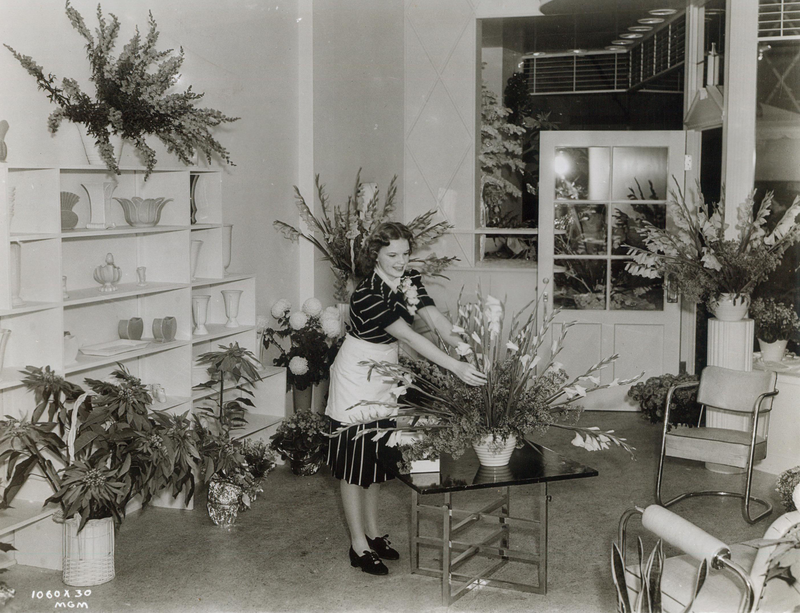 It was acquired by the Judy Garland Museum in Grand Rapids, Minnesota, directly from her third husband, Sid Luft. In 2011 it was sold at auction for $30,000. 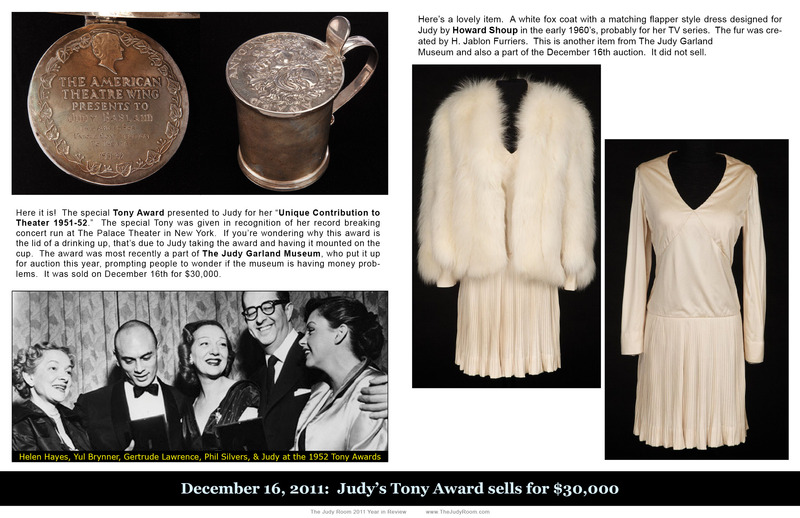 To see more items from that auction, check out The Judy Room’s 2011 Year in Review (PDF). 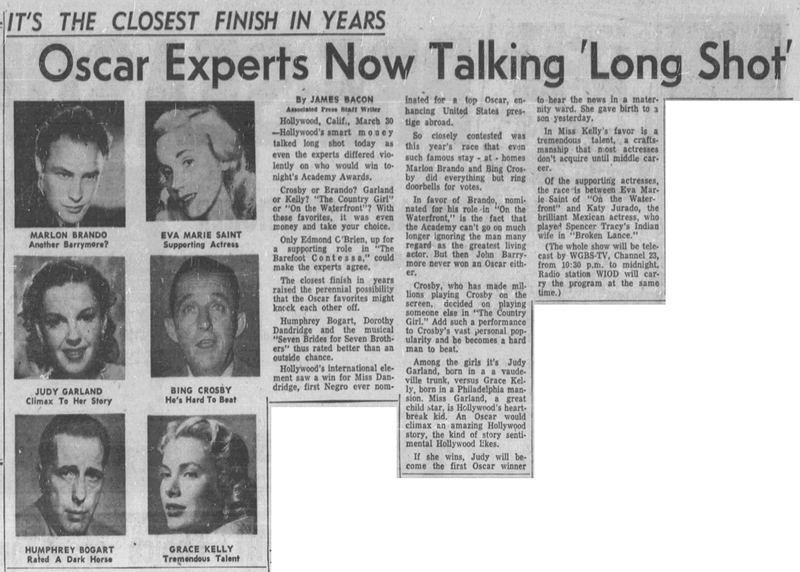 March 30, 1955: Judy was to be televised during the Academy Awards broadcast on NBC-TV, from her hospital room. She had just given birth to her son Joe the previous day. Everyone was so sure Judy would win Best Actress for A Star Is Born that the network went to the trouble and expense of setting up a special scaffolding outside her hospital room window, as well as taking over her room, to ensure that they captured her acceptance speech. 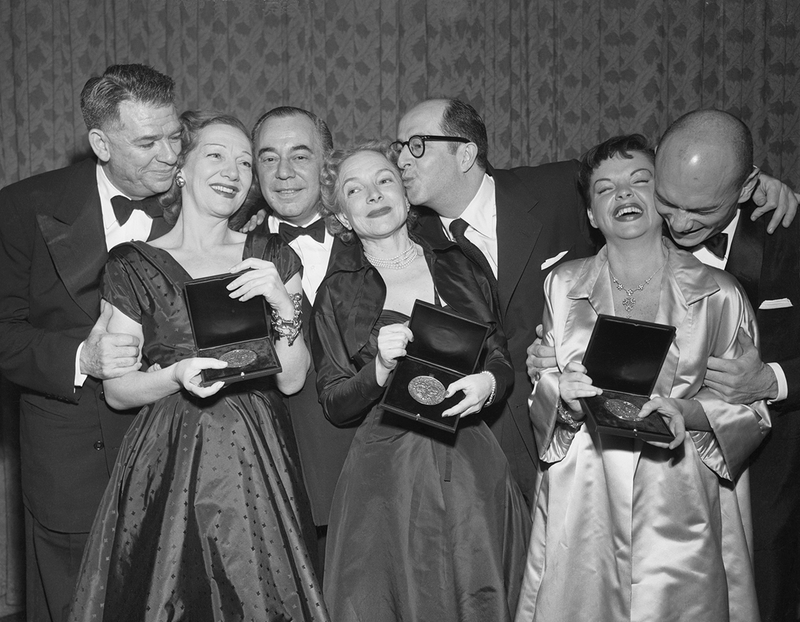 Unfortunately, Judy did not win, losing to Grace Kelly’s performance in The Country Girl. Later, Judy would share her funny story about how the TV crew simply packed up and left without saying a word after the announcement was made. Always the optimist, Judy was able to turn this great loss into a funny anecdote. Today, the film is considered a masterpiece and most people have never heard of (or even seen) The Country Girl. Photos: The scaffolding outside Judy’s hospital room; international poster art. March 30, 1958: If you’ve ever wondered who dubbed Judy in the German language versions of her films, well now you know. It was Marion Degler. I’ve seen the German dubbed version of Easter Parade on German TV and Ms. Degler did a good job. The songs were not dubbed, but included subtitles so everyone still got to hear Judy sing. 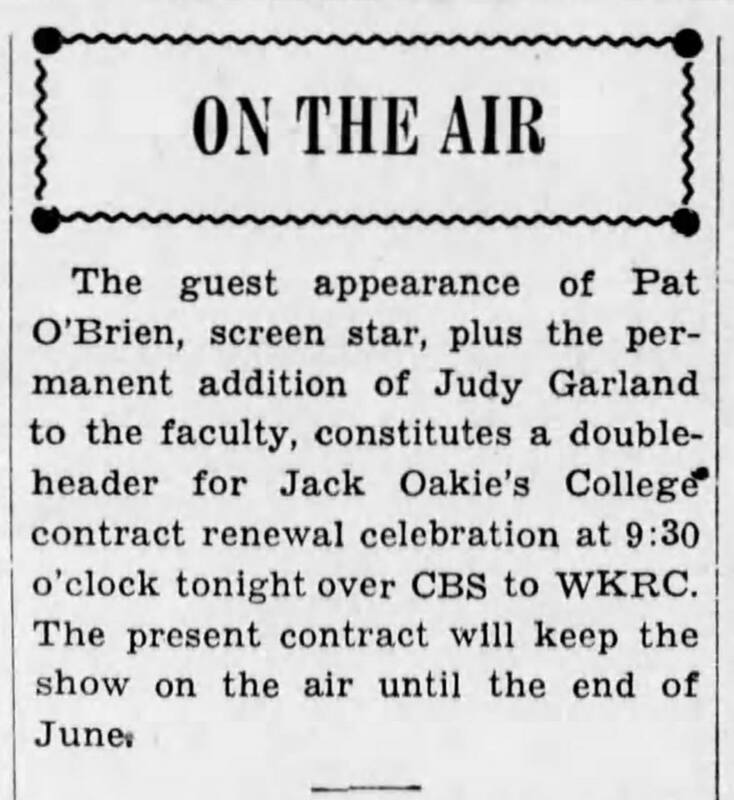 March 30, 1958: Judy managed to get through the first two songs of her act at the Town and Country on this night, then announced that she had been fired and left the stage. Judy had developed severe colitis shortly after opening at the venue but had somehow managed to get through her shows until this night, then the manager of the club fired her. Judy claimed that she was assaulted by the club’s manager, Ben Maksik, as she left the stage. Maksik told reporters that he had paid Judy and advance of $40k although Judy denied it claiming she hadn’t seen any money from the engagement. Meanwhile, New York state put a lien on her salary for $5,500 in back taxes. Maksik claimed that Judy told him she wouldn’t appear unless she received the balance of the salary for the rest of the engagement. She was receiving $25k per week and wanted the $50k balance before going on. He then tried to persuade her to not go on stage because he could see that she was sick. Judy got through the first two songs then announced that she had a “terrible case of laryngitis” and walked off saying she had been fired. Photos: Three shots of Judy backstage (captions below) plus newspaper clippings detailing the event. 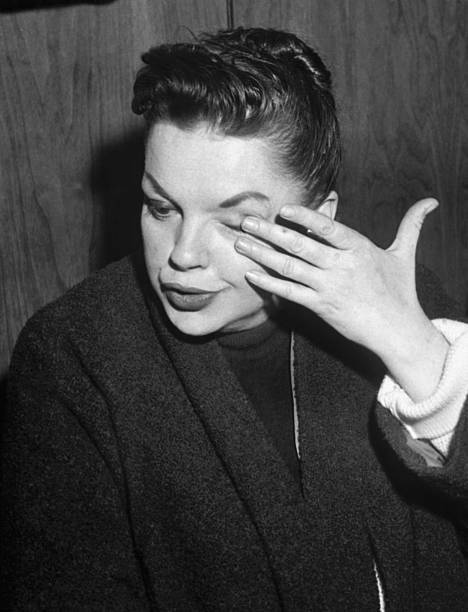 Photo 1: Singer Judy Garland wipes away a tear in her dressing room at the Town and Country Club in Brooklyn where she walked off stage last night after singing her second number – ‘Life Is Just a Bowl of Cherries.’ She told her audience of 1,700 that she had laryngitis and added ‘It doesn’t really matter though, I’ve just been fired.’ Ben Maksik, whose nightspot is one of the country’s largest, vowed it was ‘the last walkout Judy will stage in my place.’ He said he paid about $40,000 to Judy and her husband Sid Luft in advance before Judy arrived in New York. Luft, whom Miss Garland is suing for divorce was at the club when the walkout occurred and said he didn’t like the way things were going with Judy’s contract and had called on Brooklyn District Attorney Silver about it Saturday. 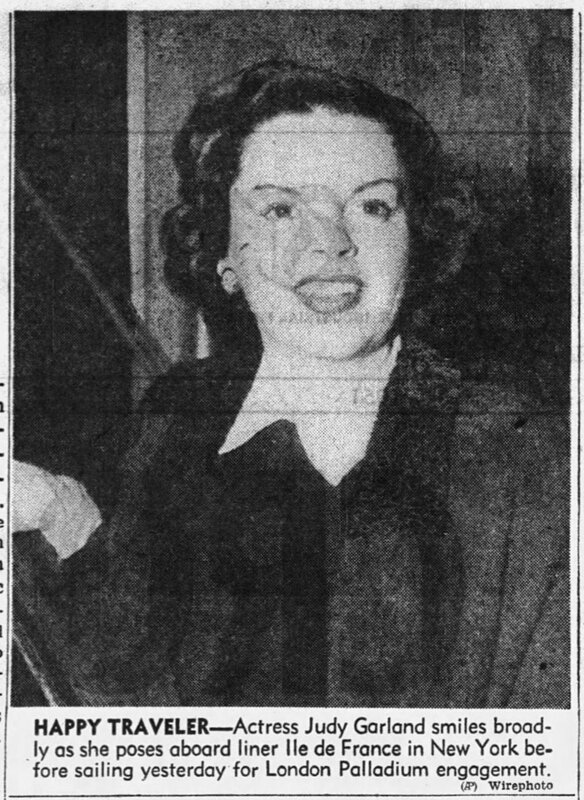 Photo 2: Singer Judy Garland walked out on a full house at the Town and Country Club 3/30 in a dispute that apparently involved money, her unhappy love life and a large dash of temperament. She went on 50 minutes late, sang two songs, and then told the audience she could not finish because she had laryngitis. 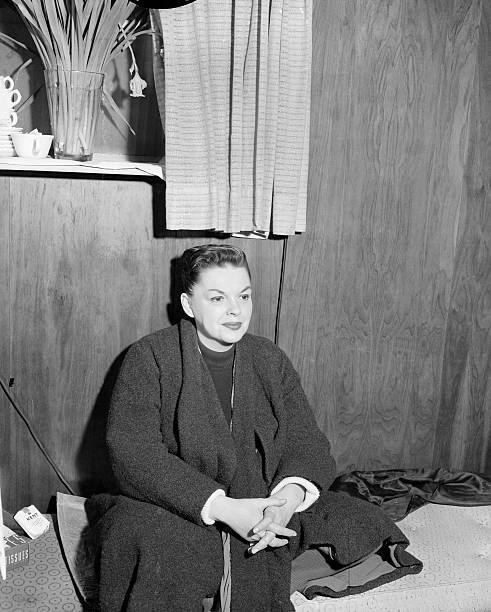 ‘But it doesn’t matter anyhow, because I’ve just been fired.’ Miss Garland is shown in her dressing room after the show, where she told newsmen she was broke. 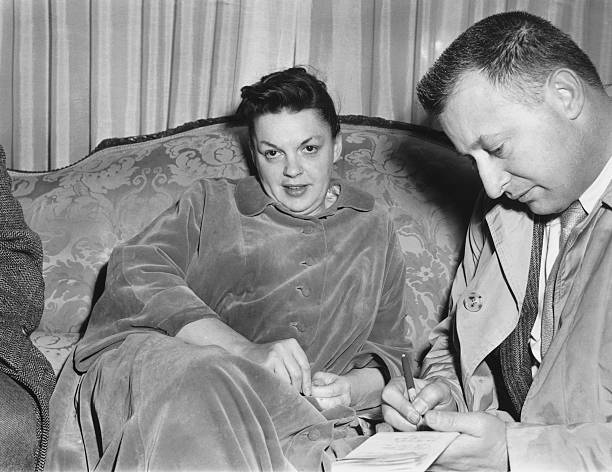 Photo 3: Singer Judy Garland points to her shoulder [note the photo does not sow Judy pointing] as she tells a reporter that it was bruised when she was allegedly struck by Ben Maksik, owner of the town and country club in Brooklyn, where singer walked off stage after singing her second number last night. Judy who told the audience that she had been fired by Maksik, said she intends to charge him with assault and battery, her engagement at the club ended 15 days early, the singer says she intends to go to Jamaica, B.W.I., to rest with her three children. Photo 4: Newspaper article detailing the events. 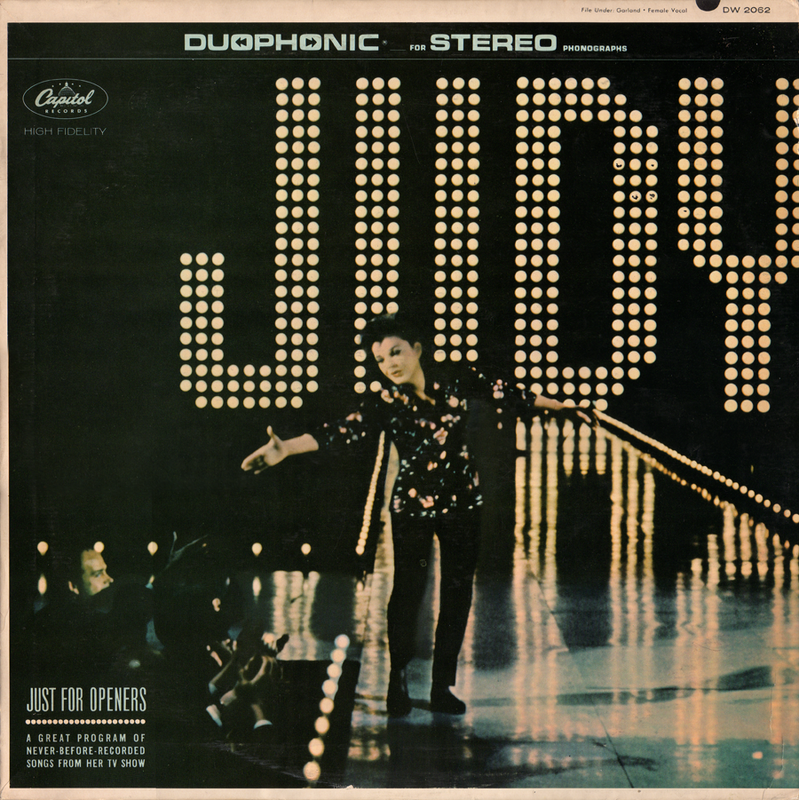 March 30, 1964: Capitol Records released “Just For Openers” which featured 12 tracks from Judy’s TV series, “The Judy Garland Show,” recorded through the sound system but in mono, not stereo. 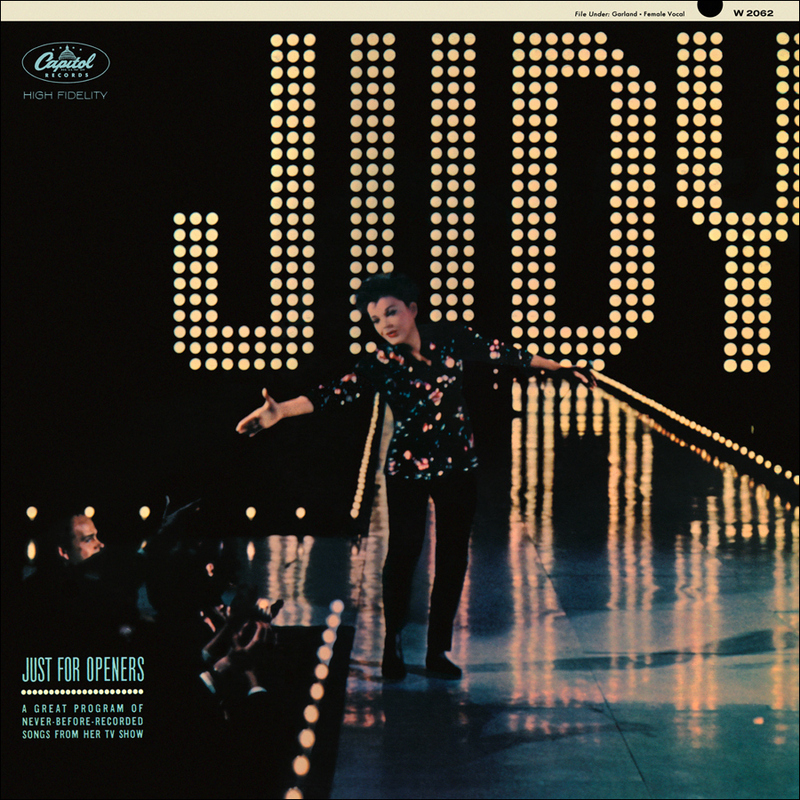 It was the only legitimate release of material from the show released during Judy’s lifetime. It was the first of a planned series of albums of performances from the series, but subsequent releases were never produced. 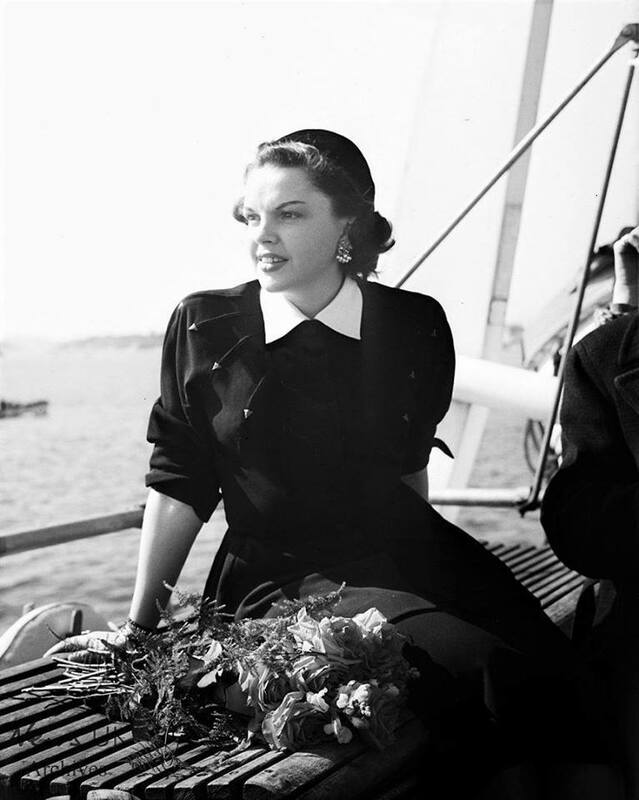 Check out The Judy Garland Online Discography’s “Just For Openers” pages here. March 30, 1965: Judy gave a birthday party at the Beverly Hills Hotel for son Joey’s 10th birthday, and for Peter Lawford’s son, Chris, who also turned 10 on the same day (Chris starred on the ABC-TV soap “All My Children” in 1995). Judy then took them to a movie. I don’t have any photos of the party, so above is a snapshot of Judy and Joey that was taken in 1965. Maybe it was taken on this night when they went to the movies? It’s possible.